Our contribution form is available in PDF format here. (You'll need a copy of Adobe Readerif you don't have Adobe Reader installed, you can download it here.) Just print a copy of the form, select your contribution level, and mail the completed form to WCMF, 740 County Route 32C, Windham, NY 12496. Welcome to the Windham Chamber Music Festival 2016 Season at the acoustically superb Windham Civic Center Concert Hall. This season marks the beginning of our 20th year of presenting great music in the town of Windham in this wonderful historic building. We are grateful to all of our donors for their generous support with special thanks for foundation support from the Willow Springs Foundation, the Peter R. & Cynthia K. Kellogg Foundation, the Windham Foundation, the Greene County Council on the Arts and the David G. Whitcomb Foundation. WCMF performances continue to be featured nationwide on American Public Media's (formerly National Public Radio) "Performance Today" program. These live recordings come from many of the world's finest musical organizations. Our 2016 season opens on February 13th with a Special Winter Jazz Concert featuring the brilliant duo of pianist Renee Rosnes and bassist George Mraz. On July 16th the popular Gala Orchestra Concert features pianist Tanya Gabrielian in her Windham debut performing Bach, Saint-Saëns and Finzi, and the Windham Festival Chamber Orchestra conducted by Robert Manno performing Tchaikovsky's lush Souvenir de Florence. August 13th brings the return to Windham of Trio Solisti with Maria Bachmann, Alexis Pia Gerlach and Fabio Bidini in music of Beethoven, Arensky and Lowell Liebermann. On August 20th we are delighted to present Divas Unleashed, a fun evening of opera and comedy with soprano Michelle Jennings and mezzo-soprano Maria Todaro. The summer season comes to a close on September 3rd with the return of the Lark String Quartet performing string quartets of Dvorak and Debussy. And on November 26th please join the Windham Festival Chamber Orchestra with violinist Elmar Oliveira and pianist Tanya Gabrielian at the Doctorow Center for the Performing Arts in Hunter, NY in music of Mendelssohn, Grieg and Finzi. This concert is presented by the Catskill Mountain Foundation and made possible by the generosity of the Jarvis and Constance Doctorow Family Foundation. Your support has made it possible to build an ongoing chamber music festival that features world-class performers and continues to give the Northern Catskill area national exposure over American Public Media's "Performance Today". Tickets available in Windham at Carole's Gift Emporium, Catskill Mountain Country Store, Windham Public Library, and in Hunter at the Bookstore at Hunter Village Square. Contributor ticket prices apply to members of the Windham Chamber Music Festival, Catskill Mountain Foundation or WMHT/WRHV-FM. 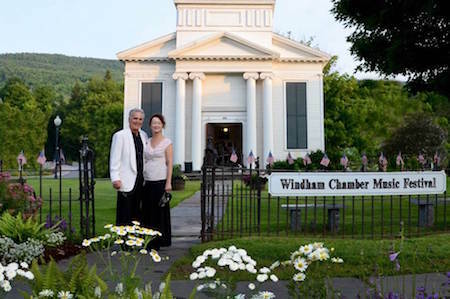 The Windham Chamber Music Festival is a 501(c)(3) not-for-profit organization. All donations are tax-deductible to the fullest extent of the law.